Stop for a second and think about what happened the last time you tried to give your German Shepherd a bath. Not a very pretty sight, is it? If you’re like most owners, you ended up with a mess all over your bathroom, water spraying everywhere, and soap suds in places you never intended them to be. After the fiasco that happened last time, you’re probably not looking forward to giving them a bath again, are you? Well now, with the Rinse Ace Pet Shower Deluxe PLUS, you can give them a bath, and actually look forward to doing it. 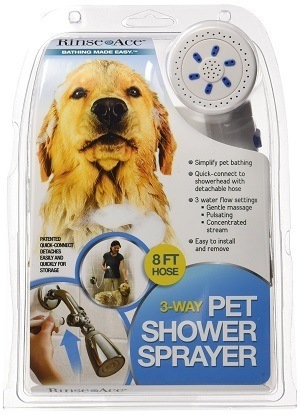 It’s an adjustable head that lets you quickly and easily bathe your dog, without getting water everywhere, and quickly rinse them off so they don’t end up slinging soap all over your shower or bathroom when they start shaking their head. Makes Bathing Your Dog Easy: You don’t have to keep filling up a cup, dumping it over your dog, and then hoping it gets down to their undercoat. The shower head with it’s adjustable settings makes it easy to get your dog wet, and then remove all of the shampoo after they’ve been washed. Gentle Full Spray Setting: This setting is perfect for getting your dog’s coat completely wet. The constant flow of water makes it perfect for getting deep down into the thick fur underneath their longer hairs. Pulsating Massage Spray Setting: The pulsating massage setting is great for giving your dog a quick massage, and works for getting down deep to their skin, when the full spray setting won’t cut it. Concentrated Spray Setting: The concentrated spray will remove all built up shampoo, leaving your dog’s hair completely clean, without getting water everywhere. Variable Flow Adjustment: If you need a softer flow, you can adjust the valve to decrease the amount of water coming out, and then turn it back up when you need a bit more pressure to work through your GSD’s thick coat. Saves A Ton Of Money: If you add up the costs of regular trips to the groomer, and compare it to the one-time price of the Rinse Ace Pet Shower, it’s easy to see how much money you’re going to be saving. May Require Additional O-Ring To Prevent Leaking: The kits do not come with an o-ring that fits between the hose connector and the pipe coming out of your wall. Because of this, you’ll want to grab an o-ring from your local hardware store when you install the shower head, to prevent it from leaking. Some Customers Complained About Low Water Flow: If your house is run off of a pump and well, or you have the incessant problem of low water flow, you’re going to get the same flow rate out of the head in the Rinse Ace. Giving your dog a bath doesn’t have to be a painful process for you. With the Rinse Ace Shower Deluxe PLUS dog shower, you can quickly and easily bathe your dog, and not have to worry about your entire bathroom getting covered in soap and wet dog. By clicking on the button below, you can learn more about the Rinse Ace, and see why so many other customers love using it on their dogs to save those expensive grooming costs.